Home / Posts Tagged "Robert Trevor Bleakley"
In the aftermath of the Great War, many commercial organisations and companies produced war memorials and Rolls of Honour to commemorate the part played by their employees. 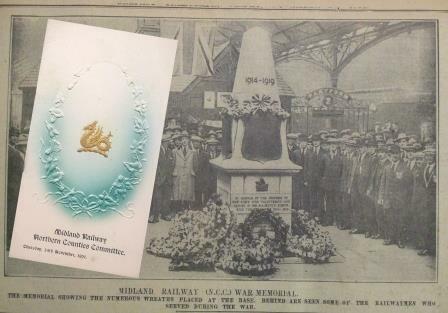 The railway companies were no exception – the Great Northern Railway Company installed identical memorial plaques in Belfast and Dublin, the Belfast & County Railway Company installed a plaque in the Queen’s Quay terminus and the Midland Railway Company (Northern Counties Committee) installed an obelisk memorial in the concourse in the York Road Railway Station. In an opening address, Major John A Torrens DL, Chairman of the Northern Counties Committee of the Midland Railway Company, paid a moving tribute to the men whose heroism was being remembered. The Reverend W H Smyth MA, President of the Methodist Church in Ireland, read from Psalm 47, which begins, “God is our refuge and strength, a very present help in trouble.” and the Right Reverend W J Lowe DD, Moderator of the General Assembly of the Presbyterian Church in Ireland, led the gathering in prayer before the memorial was unveiled by Major-General Nugent CB DSO who also gave a stirring address before the formal dedication of the memorial by the Dean of Belfast, the Very Reverend T G G Collins BD. During the ceremony, Major Torrens laid a wreath on behalf of the company and other wreaths were laid after the ceremony concluded. A large number of ex-Servicemen employed by the company attended the ceremony, many wearing their service medals, as can be seen in the newspaper picture (Belfast Telegraph, 25th November 1921). The front face of the obelisk bears a brass plaque listing the names of the 58 men who died (an additional name, Thomas Brown, being added at a later date) and the names of the 290 who served and came home are listed on brass plaques on the other three faces of the obelisk. Company records relating to employees who served are held at the Public Records Officer for Northern Ireland (Reference: T3899/1) and the file contains information that is not available in online or print resources. The file includes an eight-page document listing, by work location, the names of the men who had enlisted and details their railway job – this document formed the basis for the 1914 Roll of Honour. Benjamin Anderson was killed in action on 1st July 1916, aged 26, whilst serving with 9th Battalion Royal Irish Rifles, although his death was not confirmed until the spring of 1917. Benjamin was born on 4th December 1888 to James Anderson and Margaret Pinkerton and he married Annie McDowell on 28th October 1907 in St Anne’s Parish Church. At the time of Benjamin’s death, they had four daughters under the age of nine and Annie and the children later returned to her parents’ home at 113 Mountcollyer Road in Belfast. Each month a report detailing the numbers of men on active service (adjusted to show fatality numbers and the number of men discharged) was produced and accompanied by a Supplementary Lists of the names men who had enlisted since the previous report. James McGuigan had initially joined a reserve battalion of the Connaught Rangers but was deployed to the 8th Battalion Royal Inniskilling Fusiliers in France. As with Benjamin Anderson, James McGuigan died during the 1916 Battles of the Somme, being killed in action with the 16th Irish Division on 9th September 1916 during the Battle of Ginchy. James Joseph McGuigan was born at Albert Street in Belfast on 4th June 1879 to Patrick McGuigan and Catherine Ahern and he married Mary Drain at the Roman Catholic Chapel in Randalstown on 29 December 1906. James and Sarah were living at Drumsough in Sharvogues in 1911 and they had seven children, the first child (Peter) being born in May 1907 and the last child (Lizzie) being born in March 1915. The committee also produced regular listings of men who had been discharged from the services, some of whom were re-engaged by the company. Charles Esdale, a porter at Kilrea, was born at Portrush on 2nd July 1883 to Samuel Esdale and Jane O’Neill and was working as a farm labourer when he enlisted in the army on 21st November 1903. Having completed his seven years of regular service, Charles was working for the railway when he married Margaret Leighton at Agherton Parish Church in Portstewart on 16 November 1911. Charles and Margaret had two daughters when Charles was recalled from the army reserve on the second day of the war, being deployed to 2nd Battalion Royal Inniskilling Fusiliers in France on 23rd August 1914. He was discharged on 5th October 1915, aged 33, due to wounds that had necessitated the amputation of his right arm. He received the Silver War Badge (number 387914) which was to be worn on civilian clothing to show that the wearer had “done his bit” for the war effort. Whilst the entry for Charles Esdale in the Silver War Badge Register provides important information, it just records that he was discharged due to wounds – the Midland Railway Company records provide an insight on the severity of the wounds. History Hub Ulster was recently contacted by Harry Bleakley, a relative of one of the men named on the war memorial, who feels that the memorial should be re-located to a location where it is accessible to the public – the proposed Belfast Transport Hub would be an ideal location. Robert Trevor Bleakley was born on 29th June 1883 in Malvern Street in Belfast to Robert Bleakley and Mary Jane McIntyre. His father was a Sea Captain and his mother, who had been widowed by 1901, was the Caretaker at the Gresham Life Assurance building on Royal Avenue. Robert Bleakley junior was a boilermaker with Harland & Wolff in Southampton when he married Alice Louisa Knight on 29th January 1910 but was working as a boilermaker with the Midland Railway Company when he enlisted with 9th Battalion Royal Irish Rifles, being Killed in Action on 25th December 1916 at the age of 33. He is buried in the St. Quentin Cabaret Military Cemetery in Belgium and is commemorated on the Roll of Honour for Rosemary Street Presbyterian Church (which was destroyed in the German Air Raids in 1941) and on the War Memorial plaque in the Church of the Holy Evangelists in Carnmoney. 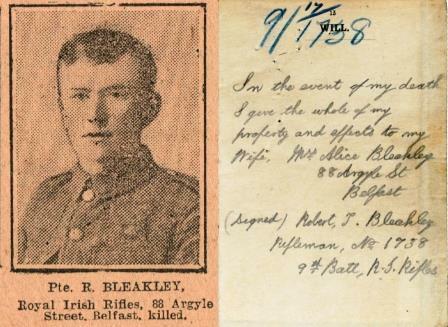 Robert Bleakley’s army will records his beneficiary as his wife, Mrs Alice Bleakley of 88 Argyle Street in Belfast. A plaque recording the names of the eight employees who laid down their lives in the Second World War was added to the memorial, which is now situated in the NIR Yard on York Road and a service of remembrance is held every November. 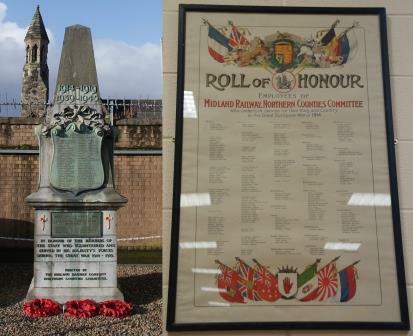 The 1914 Roll of Honour is on display at the Somme Museum in Conlig. Author: Nigel Henderson, Member of History Hub Ulster. Images from the Midland Railway Company documents reproduced by permission of the Public Records Office for Northern Ireland.